This story originally appeared on March 30, 2014. During the gloomy years of the Cold War, no other country could expect to be as badly wrecked by a nuclear war than West Germany. It would have been the principal battlefield during a full-scale conflict, and would have been caught between the largest armies ever to do battle. Not surprisingly, NATO commanders judged the life expectancy of West Germany’s airfields to be pretty short—were they to come under attack. Israel’s surprise assault on Arab air bases in June 1967 showed just how vulnerable conventional airstrips are to well-planned attacks from the air. In Central Europe, the proliferation of tactical nuclear weapons—deployed by aircraft, cruise missiles, battlefield rockets, artillery and even suitcases—further diminished the chances of an air base surviving the opening hours of World War III. In order to provide some kind of a buffer zone, West Germany located its military airfields in the far west of the country, putting valuable space between them and the heavily fortified border with communist East Germany. But the nearest West German air force base was only a mere 80 miles from the border. In aviation terms, that’s a hop and a skip away from total destruction. The Germans pursued various other options for protecting its bases to varying degrees. This included boosting local anti-aircraft defenses, hardening airfield infrastructure and improving aircraft efficiency and runway repair. Another option involved leaving the runway entirely, or for only sporadic periods. This meant landing planes on dispersed, rough landing strips or even highways. But for some war planners, the ultimate goal was to develop an aircraft capable of taking off and landing vertically like a helicopter. This would free the Luftwaffe from having to use conventional runways. The British succeeded with the Harrier jump jet. Today, the United States is attempting to create a similar plane: the F-35B. Here’s how Germany tried to do it during the Cold War. But the results were … not so great. There’s also an important lesson here. Namely, building such radical airplanes is really difficult. During the early 1960s, the Luftwaffe was busily buying up huge numbers of Lockheed F-104 Starfighters. The “missile with a man in it”—as the super-fast F-104 is popularly known—was to undertake a range of tactical roles within the Luftwaffe, foremost of which were carrying out nuclear strikes against distant Warsaw Pact targets. Enemy airfields were, of course, near the top of the target lists. But the F-104 required a long, well-maintained runway—vulnerable to being attacked early in a war. Even with a brake chute, an F-104 needed almost a mile of asphalt to come to a stop. But if Bonn was insistent on acquiring so many Starfighters, might it be possible to adapt the aircraft for more dispersed operations? 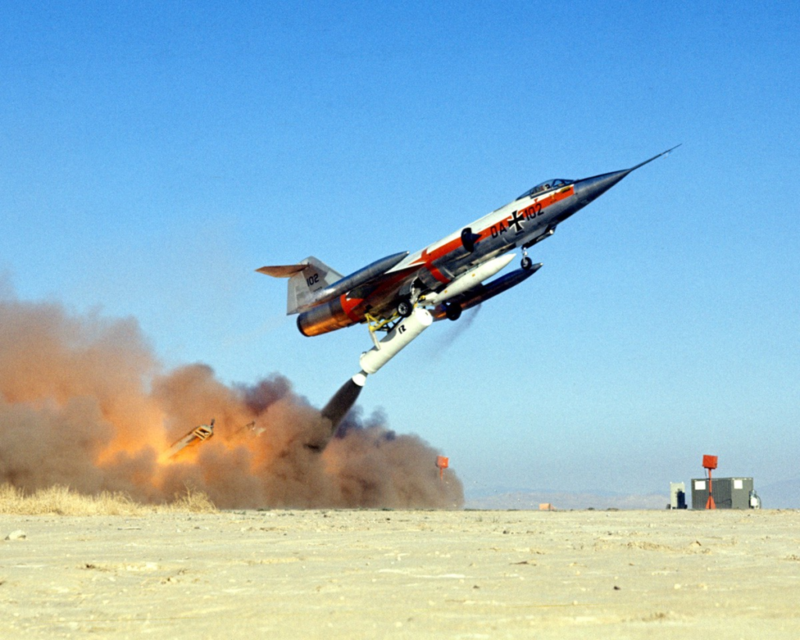 Developed jointly by the Luftwaffe and manufacturer Lockheed, the ZELL (or “zero-length launch”) system comprised an inclined launch platform for an F-104. 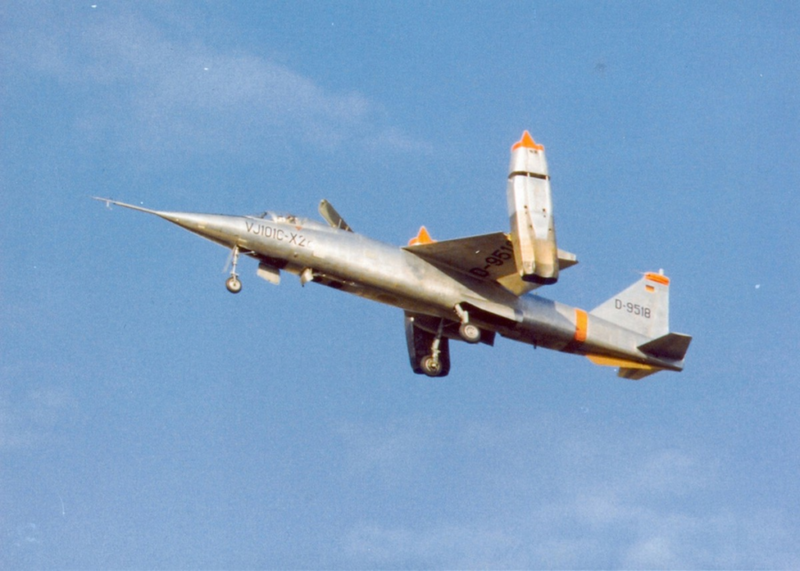 In theory, the ZELL-launched F-104 would be boosted into the air on the combined power of the plane’s J79 turbojet engine and an underslung solid-fuel rocket motor. As envisaged, ZELL operations would have involved dozens of nuclear-armed F-104s deployed on pre-positioned ramps throughout the West Germany, perhaps concealed in barns or at the edges of forests. Since a full-scale shooting war would destroy much of West Germany—most of all its suitable runways—the planners envisioned recovering the returning F-104s with arrestor cables. These cables could be slung across a semi-prepared landing strip, such as the Autobahn. West Germany spent more than $25 million on the ZELL project, but after trials at Edwards Air Force Base in California and in Bavaria, the Luftwaffe abandoned the project in 1966. Meanwhile, West Germany’s reborn aerospace industry was examining more radical concepts behind the scenes, including true vertical take-off and landing fighters. As early as 1957, aerospace firm Heinkel was drafting a “tail-sitting” fighter that could take off vertically, but like other similar aircraft, it was unwieldy and impractical. More promising was the American D-188A, developed by Bell and intended for U.S. Air Force and Navy service. The D-188A employed a pair of J85 turbojet engines mounted vertically in the plane’s fuselage, four more engines mounted in swiveling wingtip pods, plus another pair in the rear fuselage for conventional flight. Had the D-188A ever reached the Air Force, it would have carried the F-109 designation. The “tilt-jet” fighter never left the drawing board in the U.S., but inspired the German He 231 design of 1958. Designed by aerospace firm Heinkel, the He 231 employed four engines mounted at the tips of the main wing and on a reduced-span forward wing—all of them pivoting for both vertical and forward flight. As official West German interest in VTOL began to increase, Heinkel teamed with Bölkow and Messerschmitt in 1959 to pursue the project under the Entwicklungsring Süd umbrella. The project then shifted names to become the VJ 101. The VJ 101 design passed through various iterations, using different airframe sizes and engine arrangements, before the designers finally settled on an aircraft that combined pivoting wingtip engines with fixed vertical-lift engines buried in the fuselage. It was a simpler solution than the one used in the British Harrier. But like today’s F-35B, it possessed a disadvantage in that the fuselage lift powerplant—a lift fan in the case of the F-35B—amounted to dead weight during cruise flight. This badly hurt its performance. Nevertheless, in early 1960, West Germany decided to build two prototype VJ 101C aircraft, one for subsonic tests, and one with afterburning wingtip engines to push it to a speed of around Mach 1.2. Prior to these aircraft taking flight, the West Germans built experimental rigs — the first named Wippe or “seesaw” in German — beginning in May 1960. George Bright, an American test pilot familiar with VTOL flying, came over to help. Coincidentally, NATO was on the lookout for a new, survivable V/STOL (Vertical/Short Take-off and Landing) fighter and reconnaissance jet, outlined under its NBMR-3 requirement. Subject to a number of changes, this requirement had the potential to replace a huge number of active aircraft from the F-104 to the tiny Italian Fiat G.91. In another parallel with the F-35, the VJ 101 ran into numerous powerplant problems. The planned Rolls-Royce RB.153 turbofan engine was very advanced for its time, but would not be available for some years to come. Instead, the VJ 101C used the less powerful RB.145 engine. On Dec. 19, 1962, Bright took the prototype aloft in vertical mode, and free-hover testing followed in April. Finally, in August 1963, the plane completed its first conventional take-off and landing flight. But after demonstrating speeds of greater than Mach 1, the prototype crashed in September 1964. Bright ejected safely. A second prototype took to the skies by October. This design used more powerful afterburning RB.145 engines, and eventually achieved a speed of Mach 1.14 in level flight. Unfortunately, tests revealed that the wingtip jets were troublesome in VTOL mode, and that more powerful units would only make it worse. The blazing hot afterburner was also too close to the ground in vertical flight. A similar “downwash” problem has caused problems for the F-35B when taking off from the decks of amphibious assault ships. The West Germans halted VJ 101 production, and the far more ambitious, Mach-2 VJ 101D remained on the drawing board. A powerful strike and reconnaissance jet, this variant would have featured two fuselage RB.153 engines with rotating exhausts for lift and cruise, supplemented by five fuselage lift jets behind the cockpit. While the VJ 101 came to naught, the engine apparently inspired the Soviet R-79V-300 used years later in the Yakovlev Yak-141 V/STOL fighter project. The same concept of an afterburning turbofan with vectoring nozzle is now powering the F-35B, of course. Amid the VTOL mania of the early 1960s, the Luftwaffe also planned to operate a vertical-lift jet transport plane known as the Do 31. The hovering transport was also pitched at another NATO requirement, NBMR-4 of 1962, which envisaged a transport plane to support the NBMR-3 strike fighter from its dispersed battlefield bases. 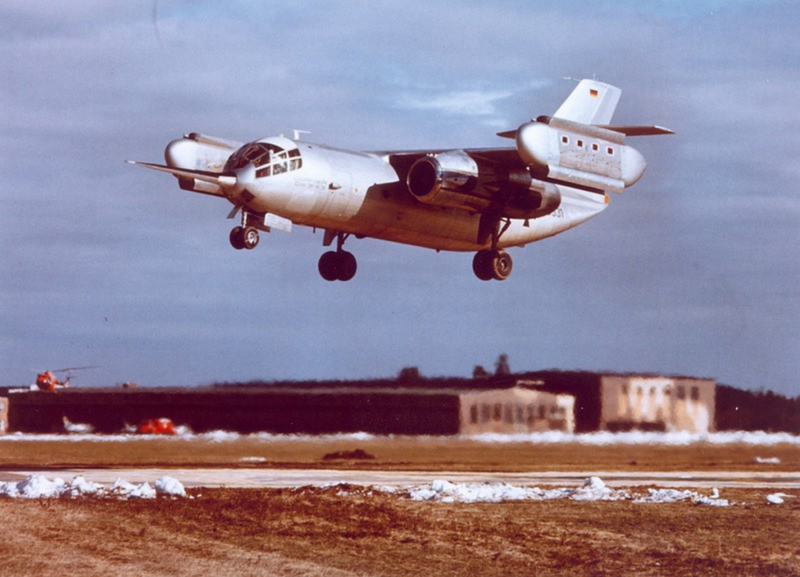 The West German military provided funding for the Dornier Do 31, which included two “hovering rigs” followed by three full-scale prototypes. The British were also keen to get involved in the project, and first provided the engines before joining forces to develop the more capable Do 231, which would have carried 100 troops. The Do 31E began flight testing in February 1967. It was propelled by the thrust of two Rolls-Royce Bristol Pegasus vectored thrust engines carried under the wings—similar to those that would later power the Harrier—plus four RB.162 direct-lift engines carried in pods at each wingtip. By early 1968, the Do 31E was flying the full flight profile: vertical take-off and landing, plus high-speed flight at speeds of up to Mach .67. Another American pilot, Drury Wood, a Marine veteran of World War II and Korea, was responsible for the test work. NASA even joined in the test effort. The Do 31E proved the concept of a VTOL jet-lifter, and both West Germany and the United Kingdom backed the promising airplane. But by the end of the 1960s and NATO’s shift to Flexible Responsedoctrine—which de-emphasized massive nuclear retaliation—the military need for a VTOL transport plane diminished. Operating costs for the experimental plane were also prohibitively high. With no fewer than 10 engines, the Do 31E was a heavy and complex gas-guzzler, and stability would be compromised if even one engine were to fail. Another factor in the demise of the Do 31E was disinterest from the U.S. Air Force, which saw little urgency in distancing its operations from vulnerable air bases. At one time, Dornier had high hopes that aircraft might be adopted as a commercial regional airliner, buzzing office workers from city to city. But this was never likely. Not only would city-center VTOL planes never have been safe enough or practical, but in common with its VTOL fighter cousins, the Do 31E was ear-splittingly loud. 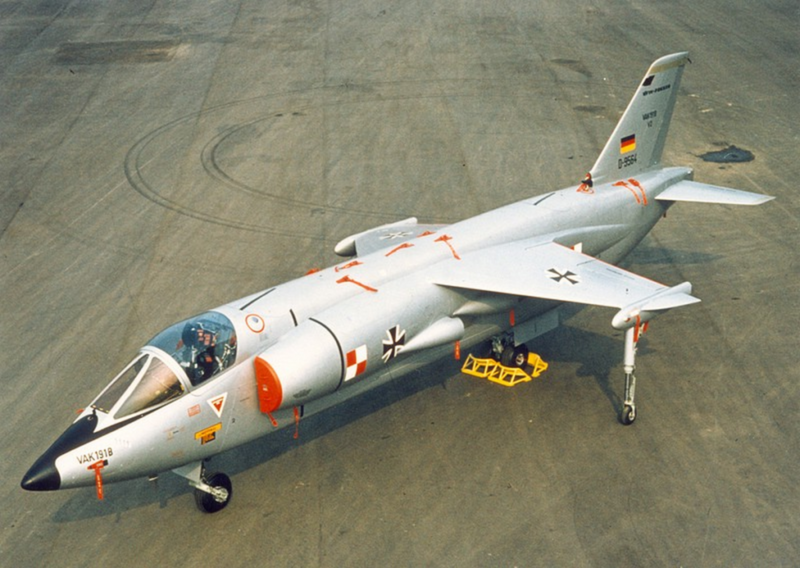 The Do 31E was not the end of West Germany’s brief fascination with VTOL. In late 1961, the NBMR-3 requirement prompted design work on yet another new V/STOL fighter, as a replacement for the Fiat G.91. The G.91 was a conservative design that NATO had selected as a standard lightweight strike fighter in 1958, but only West Germany and Italy operated it in this role. In mid-1963, the two countries joined forces on the VAK 191B. To power the plane, the German and Italian designers selected a single Rolls-Royce RB.193 lift/cruise engine—with four vectored nozzles in the center fuselage—and two RB.162 lift jets, one in front and one behind the main engine. Even before it had flown, however, the VAK 191B fell victim to Flexible Response. Low-level nuclear strike was no longer the priority for NATO, and war planners began to conceive a future conflict in which airfields might survive the initial atomic onslaught. With this, the VAK 191B was reduced in priority from a potential 1,000-aircraft program to little more than a test project. In 1968, Italy left the program. And in the same year, the United Kingdom, Germany and Italy created the Multi-Role Combat Aircraft (later the Panavia Tornado), putting the final nail in the VAK 191B’s coffin. It was not until April 1970 that the VAK 191B took to the air, and a free hover only took place in September 1971. Two more flying prototypes followed, and the flight envelope was gradually expanded to include transition from vertical takeoff and landing to high-speed level flight in October 1972. By the end of the year, funding had been cut off entirely. The VAK 191B was also hardly practical, with shortcomings in terms of thrust, payload and agility—a product of its relatively tiny main wings. VFW-Fokker, which ended up with responsibility for the project, had advanced derivatives on the drawing board, including a supersonic version (in its original guise, the VAK 191B topped out at Mach 0.96). They were never to be. The two companies attempted to refine the design as the Advanced Vertical Strike, to be powered by the radical Rolls-Royce/Allison XJ99. This engine offered an incredible thrust-to-weight ratio of twenty to one. But all in all, AVS was “so complicated that it could hardly have been considered a practical proposition” wrote aviation author Bill Gunston. Not surprisingly, AVS found no interest and was swiftly sidelined. After much initial promise, the dream of finding freedom from airfields had come to an abrupt end at the behest of the NATO planning committees. West Germany would continue to operate its aircraft from long runways, leaving them at great risk for the rest of the Cold War. More broadly, with the exception of the Harrier, no other fixed-wing VTOL aircraft has found true success. Now it’s down to the F-35B to repeat this rare achievement, and avoid the fate of the Harrier’s forgotten Cold War rivals.